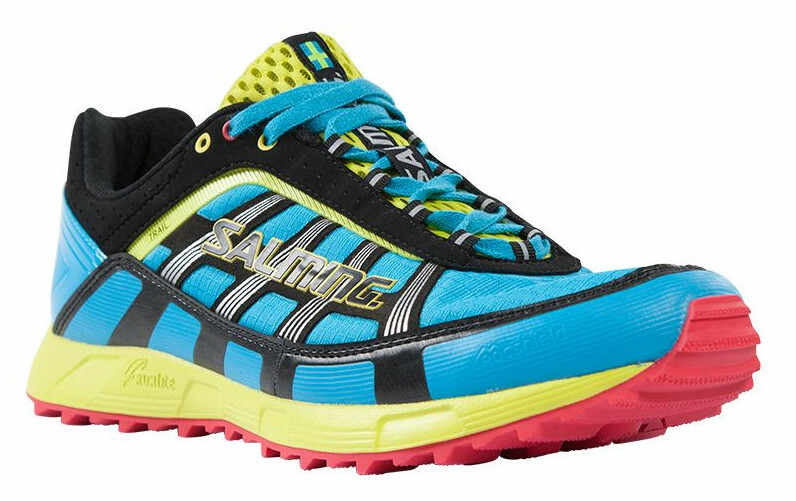 I have been wanting to post my review of the Salming Trail T1 for a while, but end of the year races and a bit of off-season rest greatly limited the amount of time I have had to review new products, especially shoes (which I don’t like to experiment with too close to races). After finally getting a few more runs in them recently though, I can go ahead and share my thoughts. DISCLAIMER: I have no formal affiliation with Salming, however, they did provide me with a demo pair for my review. Salming, hailing from Sweden, is one of the newcomers (relatively speaking) to the US running shoe market. To date, they offer six different models, with the Trail T1 being their lone trail model. I have heard great things about their road shoes, so I was interested to see how well their entry into the trail market performed. Out of the box, the first thing you notice is the rather bold color scheme of the shoe. Beyond that, you will see a pretty standard shoe that clearly takes a page or two from its road-based siblings. It has a traditional lacing system and a traditional tongue. One of the add-ons to the outside of the upper on the T1 is the RocShield, which is a toe guard that wraps around the outside front of the shoe to help protect the toes on those occasions where you catch a rock or root. I would classify the fit of the T1 as true to size. Its fit and feel feels similar to the Scarpa branded shoes that I have reviewed in the past, if not perhaps a tiny bit more snug. It does have a bit of a stiffer feel than I expected and the upper doesn’t seem to have much stretch to it, which made me wonder how it would feel in action. I have narrow feet and the shoes didn’t seem too big/wide, but as I learned in the run, I experienced a bit more slippage that I expected when I first put the shoes on. As most of you know by now, I do most of my test runs in and around the varying terrain of Salt Lake City. Running in the mountains and foothills in the T1s ended up giving me two distinctly different impressions. In the foothills, where the trails are a bit more groomed and rolling, these shoes performed well. They were responsive and provided a great amount of traction, allowing me to run with confidence. I really have no complaints on this type of terrain to call out as they seemed to have been engineered with this in mind. It was when I took them to the steep, technical trails of the Wasatch where these fell a bit short for me. For one, I had a bit of slipping in the shoe on the steeper downhills that caused hotspots after only 7-8 miles. Another cause for concern was the stiffness of the outsole. They didn’t seem to conform to the terrain as well as I would have liked. While I had no ankle rolling incidents to speak of, I was not comfortable in the way the shoe flexed when traveling over rocks. They also didn’t seem to loosen up after about 50 miles on the shoes either, so that is a minor concern for someone like me that has a history of rolled ankles. The upper seems pretty durable, which I would expect from the nylon material used. And while I have read other reviews expressing some concerns with the feet getting hot because of this material, I didn’t really experience anything of the sort. The outer provides solid, reliable traction on all conditions that I tested (no snow). Pretty responsive, allowing for fast running, despite a weight that is somewhat on the heavier side. My biggest complaint was with the stiffness of the outsole, which caused some uneven footing on technical terrain. If you have a tendency to roll ankles, these might not be your best option. While slippage wasn’t an issue on flatter stuff, it was definitely something I couldn’t seem to fix in the T1 on steeper downhills. It makes me hesitant to use these shoes for anything over ten or so miles. Overall, this is a respectable first entrant from Salming into the trail market. While there is definitely some room for improvement, I think this shoe gives Salming a solid foundation to gather feedback and build their future trail line off of. I would slate this shoe in for those that prefer the feel of a road shoe and spend most of their time on well-groomed, flatter trails. I will still continue to use these in my neighboring foothills, but will likely find something else in my closet for the more mountainous destinations. This entry was posted in Gear Reviews and tagged gear review, product review, salming, shoes, trail, trail running, Trail T1 by Ultrarunner Joe. Bookmark the permalink.